Are you a Pepco MD or BGE customer interested in getting your energy from the sun, but are in a rental property or have been told your roof is not suitable for solar panels? We’re excited to announce a new opportunity for you to invest in clean, renewable energy! We’re partnering with Neighborhood Sun to help you power your home with solar from a nearby array. We at IPL advocated for years for strong community solar legislation which is now in effect in Maryland. And Neighborhood Sun, a local social enterprise, has community solar offers for good folks who pay for their energy through Pepco MD or BGE. You can now subscribe to the electricity produced by a local solar facility right here in Maryland! Together, with hundreds of other subscribers in your neighborhood, you can join a shared solar project and get your electricity WITHOUT installing any panels on your roof or paying upfront fees. – Lock in a stable rate for your electricity. Find the details here for Pepco MD and here for BGE. – Be a member of a strong community of local solar supporters caring for our common home. – Support IPL — for every sign up, Neighborhood Sun will donate $100 to help us continue our work. What do you need to do? Just decide to buy local clean energy — that’s all! Learn more and sign up for community solar here! Groups of neighbors are coming together to purchase solar for their homes in the following areas. Click on the links for the current co-ops below and scroll down to submit your address and find out if your home is a promising site for solar panels. Based on the same principle as buying in bulk, the group will go through the process of purchasing home solar systems together. Guided by Solar United Neighbors (previously Community Power Network), which has successfully organized several such co-ops previously, the group will select a single contractor to install systems on all of the homes. Each participant will own their system and will sign their own contract with the chosen installer. By going solar as a group, participants will save up to 20% off the cost of a solar electricity system, and will have the support of the co-op throughout the process instead of having to go it alone. To learn more, email solar@ipldmv.org. 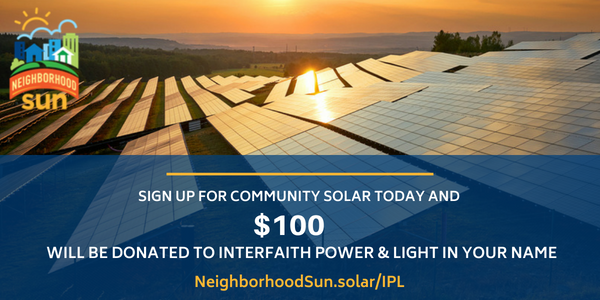 For every member of the group to go solar at home, a donation will be made to Interfaith Power & Light, which helps congregations across the region respond to climate change. Pay a DC home energy bill and don’t think you can afford solar? GRID Alternatives, a non-profit solar installer in DC, may be able to provide free panels for your home. Find out if you qualify and sign up here.